Romance for Piggy and Groban. 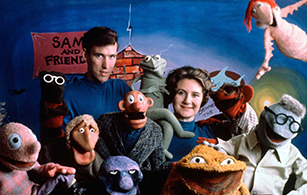 And now we continue our journey through Jim Henson’s first Muppet show, Sam and Friends, with the remaining episodes I was able to gain access to. For those of you who might not have heard of Sam and Friends, Jim Henson’s very first Muppet TV show, I gave a bit of background for it the other day on my post on Jim’s early years, but, to recap, it was an enormously popular local Maryland show that originally ran daily on weeknights for 5 minutes between the 11 PM evening news and The Tonight Show. 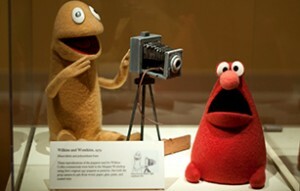 Some time around 1960, shortly after marrying Jane, Jim Henson got a Bolex 16 mm movie camera, which had a side release button and allowed him to immerse himself in artistic pursuits other than puppetry, including the short animated film above, which he referred to as an “animated painting”. In 1957, as I explained yesterday, Jim and his partner, Jane, were approached by the Wilkins Coffee Co., a local brand in Maryland, to produce humorous commercials for them, and Jim responded with a series of ads that is pretty jaw-dropping even today. 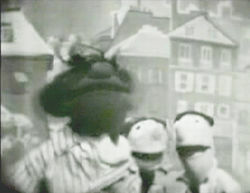 For the ads, Jim created two new Muppets: the skinny, tall, cheerful Wilkins, and the squat, short, perpetually unpleasant Wontkins, the basic gist being that Wilkins loves Wilkins coffee–he WILL drink it!–and Wontkins doesn’t–he WON’T drink it–but Wilkins won’t let that slide and so instead inflicts numerous, increasingly imaginative tortures on Wontkins for daring to refuse a cup of the precious caffeinated liquid gold.